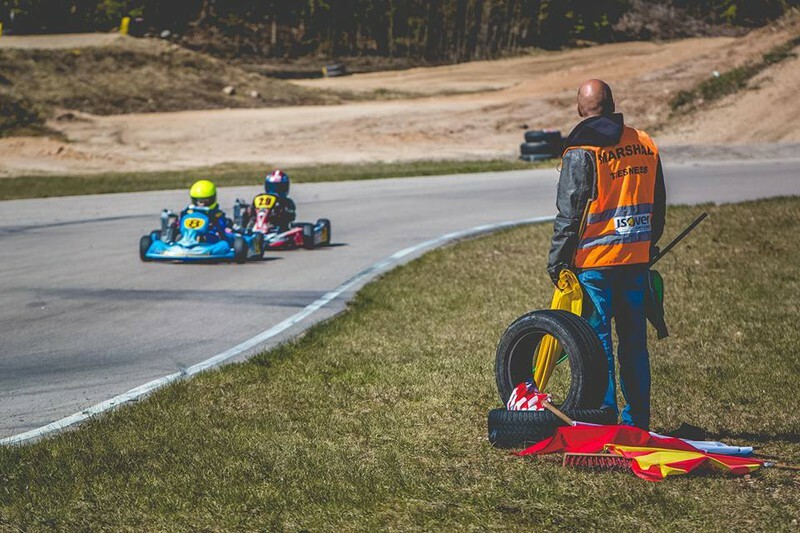 Yesterday we opened interesting and promising Karting 2017season with first races - Latvian Karting Open Championship and Pro-Kart Cup Stage 1. We are pleasantly surprised by the young and talented riders, for those who climbed to the other classes in order to further develop their professional growth. As well as the riders who during the winter improved their form and continue to fight and compete in their own, existing classes. At race opening ceremony, to motivate riders, a speech was given by Karting commission and our karting dad - Valdis Brutāns and Madona’s children and youth sports school director Voldemārs Šmugais. In contrast, for musical performances took care of young and talented singer - Nadīna Stirniniece. Many thanks also bushy troop of supporters who had come to support the precursor, or simply watch the intense competition. Unfortunately, during competition framework was also quite an unpleasant moment. Clash took place on the track and a pretty hard hit DD2M class rider - Jānis Boks who before the new season autocross decided to lead the drills karting track in order to better prepare for the new season. Jānis has six broken ribs, of which two are double fracture. It is also a fractured shoulder blade, and both sides are heavily banged lungs. Sincerely, we wish Jānis a fast recovery and further progress on the track! 3rd place - Andrey Degtyarev. 3rd place - Kārlis Bricis. 2nd place - Murad Mirzoev. 3rd place - Konstantīns Sarans. 3rd place - Ernests Riekstiņš. 3rd place - Rūdis Bērziņš. 3rd place - Matīss Maļinovskis. 3rd place - Gustavs Māliņš. 3rd place - Kristīne Mēnese. 3rd place - Jevgēņijs Monahovs. 3rd place - Krišs Jaunzemis. 3rd place - Raivis Kirilovs. 3rd place - Veronika Golovačova. 3rd place - Mihails Timofejevs. 3rd place - Denis Lebedev. 3rd place - Eduards Daņiļēvičs. Already on May 20, after 2 weeks, we will meet in SK333, at the second stage of the season, which promises to be no less dynamic and exciting! As well, welcome all riders, who today won awards, while the riders who narrowly missed success late to overtake it in the next race! We will see you at the track very soon!